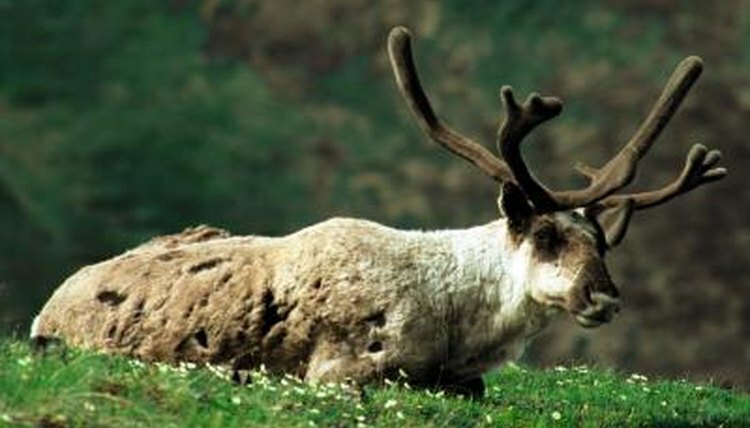 Caribou are among the few large animals able to survive the harsh arctic tundra. Large and gregarious, caribou are important to the ecology of the region by being consumers of vegetation, prey for the local predators and domesticated livestock of humans. Caribou are large members of the deer family (Cervidae). The biggest males stand nearly 4 feet high at the shoulder and weigh up to 400 pounds. Though the species exhibits marked sexual dimorphism, and some males can be twice the size of the females, caribou are the only deer species in the world in which both sexes possess antlers. While their current range has been reduced, they were historically found around the globe from as far north as the 46th parallel to as far south as the state of Maine in the United States, as well as Germany, Great Britain and Poland in Europe. The caribou habitat consists of treeless arctic landscapes and subarctic forests. Caribou are exclusively herbivores; given their size and gregarious nature, they have a direct effect on the plants in their habitat. Lichens -- symbiotic combinations of algae and fungi -- are an especially important food source for caribou, especially in the winter. When the summer comes, leaves and shoots from willow (Salix sp.) and birch (Betula sp.) trees, along with mushrooms and grasses, become staple food sources. Because of their size and numbers, caribou are important prey species for most large predators of the arctic and subarctic habitats. Gray wolves (Canis lupus), grizzly bears (Ursus arctos) and black bears (Ursus americanus) will hunt and eat calves and sick or old adults. Healthy, young adults are less vulnerable to predation because of their size and formidable antlers. The herding behavior of caribou also provides protection from predators. A 2013 study by Craig Nicolson, et al., published in “Ecology and Society”, estimated that wolves cull approximately 6 percent to 7 percent of the adult caribou in their study area each season, while humans in the same region harvest only about 2 percent to 4 percent of the caribou. Humans have domesticated one subspecies of caribou -- known most commonly as reindeer -- for thousands of years. These herders have used the parts of the animals as a source of food, tools and clothing. Humans also hunt caribou for both sport and sustenance. Caribou conservation and management is often at odds with the timber industry; as described by Eliot L. Terry, et al., in a 2000 study published in the “Journal of Applied Ecology.” The winter habitat of mountain caribou (Rangifer tarandus caribou) is old-growth forest; as such, harvesting these valuable trees damages the habitat available to the species.